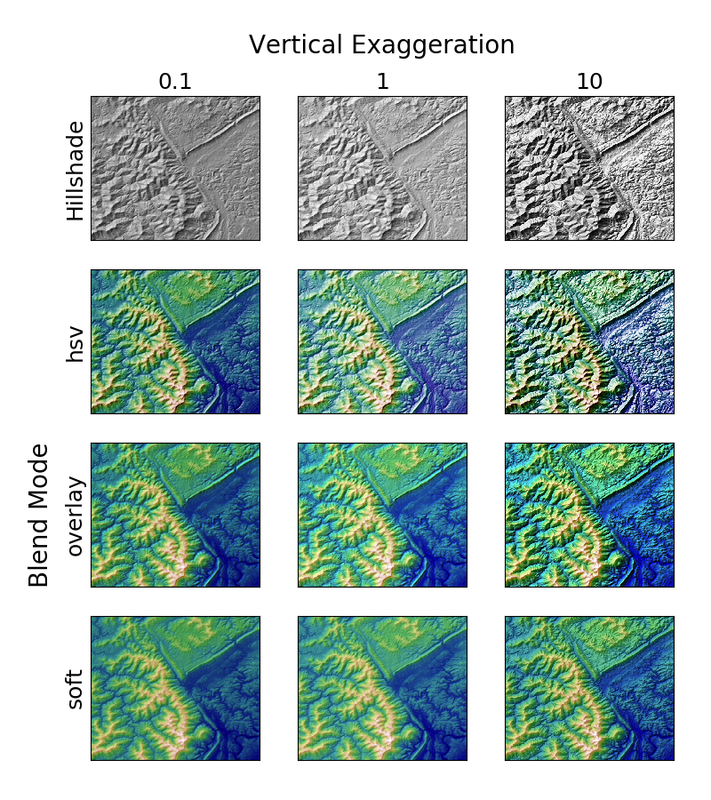 Demonstrates the visual effect of varying blend mode and vertical exaggeration on “hillshaded” plots. Note that the “overlay” and “soft” blend modes work well for complex surfaces such as this example, while the default “hsv” blend mode works best for smooth surfaces such as many mathematical functions. In most cases, hillshading is used purely for visual purposes, and dx/dy can be safely ignored. In that case, you can tweak vert_exag (vertical exaggeration) by trial and error to give the desired visual effect. However, this example demonstrates how to use the dx and dy kwargs to ensure that the vert_exag parameter is the true vertical exaggeration. # and *dy* are assumed to be in the same units as your input z-values.